I have a new piece up at CNN (here's the English language version. I've just never, to my knowledge, been translated before, so sharing this!). I try to make some big points, but at the core there's an amazing story. I got a message about an expectant mother of twins, one of who had Down syndrome, who was thinking about leaving her child with Down syndrome at the hospital (under safe haven laws this is not a crime). Still, it's not the best answer, so I got in touch with a friend, Amy Allison, who then put me in touch with Stephanie Thompson, the head of the National Down Syndrome Adoption Society. Stephanie reached out to "Jane," the mother, and eventually Jane decided to keep both children. To my mind, contact with the community - information - helped ease the fear of the unknown. 1. I did nothing much. This isn't a story of me saving the day, but just sending a couple emails. As a result, lives changed. That's astounding. 2. We don't know the end of the story. This is not a "happy ending," but a better beginning. I wish Jane, her spouse and her children the best, but I also don't want to pretend the challenges aren't real. 3. This argument applies to all kinds of niche groups. The link was dropped in edits, but I wanted to link to Seth Mnookin's New Yorker article on fighting rare diseases. I know many people in the Queer community feel similarly that internet contacts are amazing for people, especially kids, who are isolated. There's a dark side too - hate groups find these connection tools equally powerful. 4. I cannot imagine a more pro-life story than this one. It's about a family trying to stay together after receiving better information and good contacts. I am, as anyone who reads me knows, pro-choice and anti-eugenics. I want people to choose life. 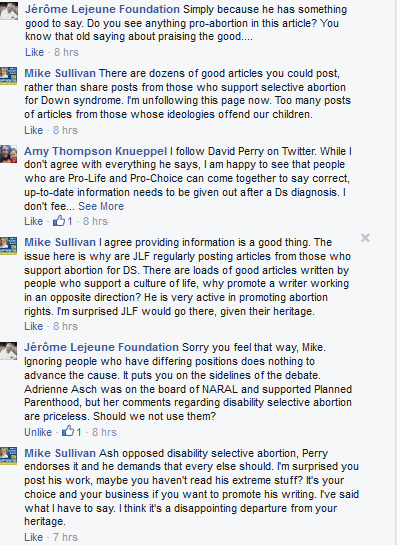 I want people NOT to choose to abort based on pre-natal diagnoses of disabilities. But it is NOT the job of the state to regulate women's bodies. It is not the job of the state to make abortion, of any kind, illegal. It is ALSO not the job of the state to practice eugenics itself. Pro-choice, pro-information, anti-eugenics. Now that stance is going to upset some of you in the Down syndrome community, and I regret that. What I really regret, though, are the reactionary voices who, because they disagree with me on abortion, can't celebrate the story I'm sharing here. 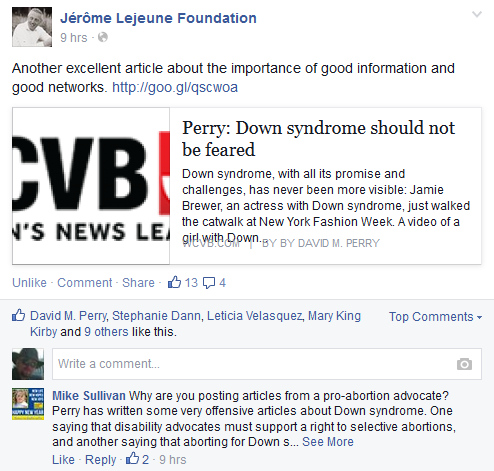 The Jérôme Lejeune Foundation is a strongly pro-life Down syndrome group. We don't see eye-to-eye on many things. But in the end, both of us want better lives for people with Down syndrome and to help parents, children, adults with Down syndrome, and communities do better. So they shared my story. And then came the reactionary backlash. Sullivan basically wants to exclude anyone from the Down syndrome community who doesn't cleave to his hardline on abortion. He enters threads and demands that every conversation be solely about abortion and banning abortion. He's not alone, but rather an egregious example of a type. So let's be clear. I welcome collaboration to my pro-life colleagues to our ongoing efforts to make life better for people with Down syndrome and other disabilities. I will try to persuade you that state regulation of women's bodies is not an ethical OR practical solution (it will just made Down syndrome code for poor as, elites will continue to abort, for example). I expect you to try to persuade me that I'm wrong. I am ready for that debate. We have to build coalitions. I'm here. Are you?